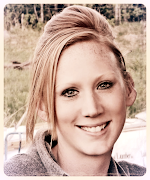 Erin Blegen: My Scrap Cabin: Webster's Pages Blog Hop!! Hello everyone!! 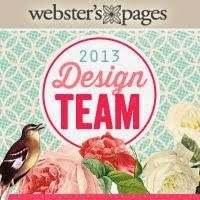 Welcome to the Webster's Pages Blog Hop!! If you've come here from the beautiful Gerry's blog, then you're right on track! If not, head to the beginning of the hop HERE so that you can start from the beginning :). Today is no ordinary Monday~ we're celebrating the much-anticipated shipping of two new collections from Webster's Pages: Park Drive & Once Upon A Halloween!! These are both just STUNNING collections- you definitely need to see them for yourselves. If you've been just loving what you've been seeing along this hop, then you definitely need to get in on the action :)~ you can place your order by visiting the Webster's Pages Store HERE!! I seriously just LOVE how cohesive Webster's collections can be!! Now, before I let you head out to the next stop, we were asked to share a little bit about WHY we scrap. I think that this is a question that has been asked of me many times, and I usually come up with the same answer: there are MANY reasons why I scrap! With 3 little kids, the days can sometimes run into each other, and I just don't want the little things to get lost- so I put them in writing while they're still on my mind and put a picture with the memory- so I can always go back to it and relive those moments that might otherwise get lost! And also- I love to create- it's my "outlet"- a way to express myself and just get those ideas out of my head and onto some paper :). It's so exciting to see what can just happen out of a simple thought- I love that :). OKAY! So- how would you like to win some of these new goodies for yourself?! Well, there are SEVEN PRIZES hidden along the hop at different blogs- so just make sure to leave a comment at each of the blogs to increase your chance of winning!! The winners will be announced at the Webster's Pages blog on Friday, August 17th- so you will have to get your commenting in before Thursday is up! Your next stop is the very talented EMELINE!! Awwww, this is so cute!!! Fab layout! 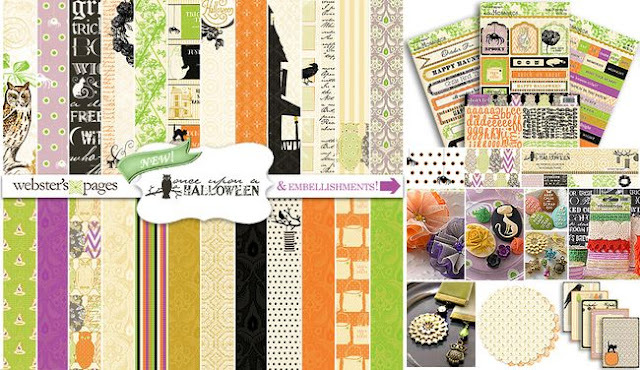 I love how you combined 3 different collections so beautifully to create your page! TFS! These three collections go together so perfectly. Your layout is absolutely wonderful! I just love the girly colours and your wonderful titlework. Beautiful page! So cute & girly! Congrats on making the DT! Whichever collection you create with the result is still fantastic! Thanks for the inspiration! To keep things in memory and to create - these are also my reasons to scrapbook. And thanks for inspiration. Lovely LO. Well done on making the team. OOO gosh this is simply stunning! Definitely one of the prettiest baby pages I have ever seen, I love the style layout, colours and wonderful laced papers, just gorgeous! Super cute colors. Sweet layout! Your layout is beautiful - I love the mix of colors. Wonderful layout! The details are very beautiful! Beautiful page Erin! I adore the colours and the punched borders look so effective. How do you do it, your layouts just seem to be getting more amd more beautiful every time. that lil face sure has alot of attitude and the layout is sweet. Aw! What a sweet, girly layout. Love it! This layout should be framed! Erin, love your work.. I have to say, that your very organized and keeping journals of what happened and when, right when it happens is something I thought about doing. When My kids where little, I thought, Oh I'll never forget that!!! Ya.. my oldest will be 26 and guess what, you do lose those little things. I made a huge mistakes as they were growing, like not dating my photos... (I did however start on my youngest fairly early on so I have more on him) But I so regret not doing what you do!... I hope EVERYONE listens and does the same that you are. I'm glad that you shared your habit with us as this is my advise to every young parents I come across. Your layout is so wonderful!You inspired me to do something new! You already know how much I love your layout! :) As much as I love ALL your layouts! Gorgeous! So true, you can combine WP collections very nicely and the accents always go so well together! Love the interplay between the collections. A delightful layout and beautiful layout! Very cute...even with the attitude :) Love the double-picture feature. Great title for your page with Attitude! pretty LO love the border punches you used. Love how you brought all those lines together. . .
Que maravilhoso LO!!! Parabéns e obrigada por compartilhar conosco esse maravilhoso doce!!! Wow look at that face!! Adorable. You caught a great pic here....Wonderful layout. I love the layers and the flowers. Amazing. Love this LO!! Especially the punched borders on the side!! This is beautiful!! Gorgeous punches and I love the double bow, too! I want to make a layout like this! What a pretty pretty page!!! So cute! Great layout, love the overlapping borders! Adore this LO and LOVE how you combined the collections! TFS!!! What a great page! I love all the borders and how you put the collections together! Love how you mixed collections for your layout! I love how you mixed collections for your layout! Really adorable girly girl layout!Love the papers and trims. Keep up with the journaling! So many things I cannot remember about my boys childhood. Your page made me smile!!! (I remember those days with MY kids!) And even with an 'attitude' the pictures are adorable!! Just adorable pages. I love how the colors all go together. Love your layout. Pink and dress forms and a beautiful little girl..
Just so pretty and so much to look at!! Love how you used Webster's Pages!! Beautiful and cute LO! Love the details. Thanks. Very pretty layout. That little face is just priceless...so cute. Oh my goodness. ADORE that DOUBLE attitude! SWEET! That is a perfect title for those pics of Lilah!! Love the pretty pink and white on this one, Erin! Love your sweet layout! That is why we scrap is so we can have the memories that we may have forgotten. You did a wonderful job of combining products! I love it when you can depend on a brand to always blend. And you are so wise to have started when your family is young! Oh, this is so precious! Love the different diecut borders. Love all the layered flowers on this page and how you still kept the pictures as the focal point by having two of them staggered placement! Beautiful designing skills! beautiful layout!!! Congrats on joining the Websters team!! I look forward to seeing more of your inspiring work! I love how whimsical your layout is. You are a great addition to the team. I look forward to seeing more of your work. So incredibly feminine, my girls would be positively cooing over this! It's so great to see how you used three different paper lines and demonstrated how easy it is to do with WP! 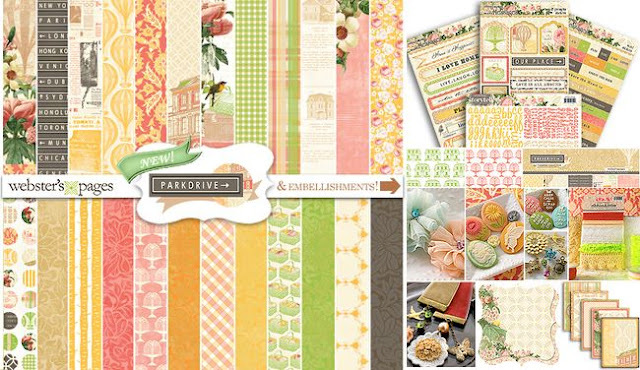 Such a sweet layout you've done with the other collections! Erin -WOW this is amazing. Absolutely beautiful. Gorgeous page, love the layered borders! She is so cute - and so is your layout! Glad you are on their team! Very Nice !! That pink has given the page such a bright fun look to it. Such a gorgeous girl too. Wow! Your layout is amazing! Hi Erin, can't wait to see what you create with the new collections!! I adore your pretty lo and those pictures are really to die for look at her eyes OMG! another scrummy layout from you. I'm sure that you could 'work' any papers together Erin ... another stunning creation. What a sweet layout !!! Very nice layout. Thanks for sharing!! gorgeous work...so excited you joined the team! So cute layout!! Love it!! Great layout. I love all the layers! Love this layout and the colours that your used just perfect...btw your daughter is just adorable!!! Love all the layering, gorgeous layout and so feminine. Beautiful clustering around the photos ! Such a sweet girly page ! This is a wonderful layout and I can so see the attitude in her picture! Thanks for offering your inspiration even though time was short. I love this colorful layout and the fact that you used several different collections in it. I mix and match too. I also like all the layering of the trim and flowers. What a beautiful page! Nothing wrong with showing us old collections. I love the layered borders and color combo. I love this page, the fashion elements are so cute. Love the dressforms. Love those pics of Lilah! Beautiful layout. Love all of your punch work!! Fabulous! What a great layout. I am loving the new collections and love to see what everyone has created. I like how you mixed the collections and used all the punches. STUNNING!!! Incredibly beautiful and sweet layout! As always a beautiful layout. nice mix of three collections. Such à cute little girl... Girlland are just the right papers to scrap this! Stunning! Awesome page. Such cute photos, and the papers are so perfect here. Love the design of your page. great layout! Thanks for sharing! Your kids will LOVE that you cared about their little lives to record the details. You've created a charming layout! WOW!!! You page is beautiful!!! I love everything about it!!! Your flower layers look so lush, I LOVE it and how you mixed up the three different lines in one cohesive layout! Love the layered punched edges! Sweetness all around, Erin!! LOVE LOVE your page ;) ! !